MW Slava, at the end of this, I will wish you happy birthday, because this is thinking far ahead towards your 75th birthday! SLAVA Yes,yes. But let’s get ready anyway. Maybe it’ll be, maybe it wont. Nobody knows what will befall us. Maybe I’ll be dead and you’ll have to wish me Happy Birthday in my coffin! MW Slava, its a great privilege for me to be able to have this meeting with you, (as an ex-pupil of yours in Moscow), and to have this opportunity to speak with you as you near your 75th birthday. Without your inspiration, most of the significant works for cello in the last half century would simply not have been written. Then through your conducting, you have brought an enormous repertoire of symphonic music and opera to audiences all over the world. In addition to that you have been associated with major events of our times in the pursuit of justice, and the energy which you have for all of this is legendary. You have often spoken about the associations with some of the most famous composers of our times, both Soviet and Western, but I would like to start off by asking you more about your early life. You were born in Baku in Azerbaijan, on the shores of the Caspian Sea. Do you remember much about your early years there? SLAVA Yes, of course I remember. I remember isolated memories from this time. I left Baku when I was four, maybe five years old. My parents took me to Moscow from Baku. But I remember our flat very well, and I remember our piano very well. I already played the piano aged four in Baku, and I first composed a Polka for piano there, and my father wrote it down for me. I can tell you it was very bad music, but maybe for a four year old it was OK! My mother played the piano. I used to hear the sound of the cello and piano, because my mother and father were rehearsing at home. And I have some photos when I was four months old; my father put me to sleep in the cello case instead of a cot - I have the photo of myself in the cello case. And that was to be my life’s path. I remember the street where we went for a walk. When my parents left the house they would leave my sister with me to look after me, and they would warn us of all sorts of dangers, by saying the gypsies might come to the house and take you away. My sister was eighteeen months older than me, and we would bolt the door with a huge heavy bar. But we would open it for our parents of course! I remember my father had some pupils. That’s really all I remember about Baku. MW Was your father teaching the cello at the Conservatoire there? SLAVA Yes, he was the first professional cello teacher in the Baku Conservatoire. And he had many friends. It was a very good Conservatoire even at that time. 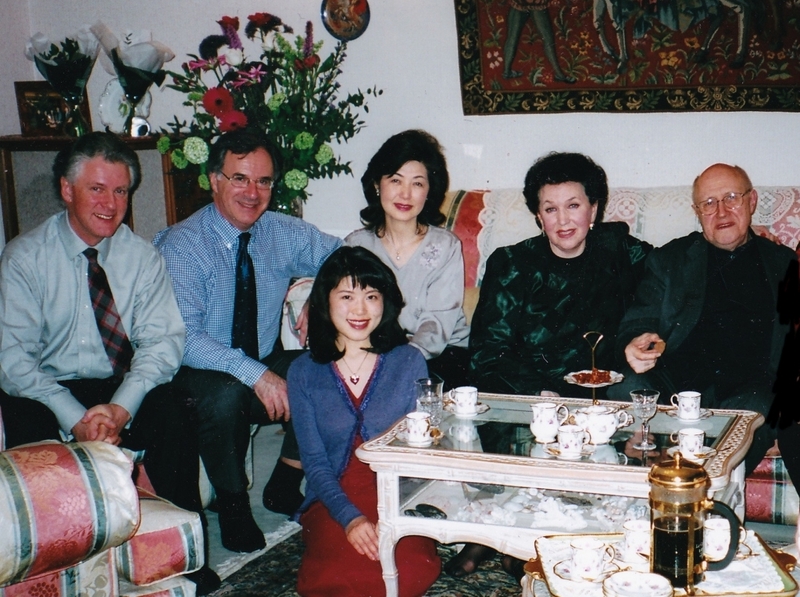 The composer Uzir Gadjibekov who is now a “classic” of Azerbaijani music was a very close friend of my parents. He wrote the first Azerbaijan national opera. He was to Azerbaijan what Glinka was to Russia. Glinka lived a long time ago, but I myself remember Gadjibekov. But I remember him a little bit later, during Stalin’s time. In Moscow they had a ten day Festival celabrating a decade of the Arts from different republics - Azerbaijan, Georgia etc, the best of music, theatre and so on. When I was seven or eight years old my father took me to a hotel to see Gadjibekov in person, and I remember that he was wearing a suit with a big Lenin medal on it - that was very rare - only a few people had that award. And I’ve remembered that all my life - this medal on Gadjibekov’s jacket. It made a great impression on me! MW Baku is in fact not so far from Turkey and Iran - it’s a matter of several hundred kilometres. Did you feel there a sense of East and West meeting in the culture? SLAVA Well , I was not too aware of different cultures at the age of four! But now I go to Baku every year - I give a master-class there - and it is very near to my heart, because my father and mother loved Baku enormously. All my life I’ve loved going back to Baku. Historically, Azerbaijan is a very interesting place. For example long ago before there was any culture there, Baku was on a route from Asia, and to Turkey also. They worshipped Zarathustra - worshipping fire - the Zoroastrian religion - and near Baku there is a place where fire comes from the earth continuously. There are many ancient shrines built by pilgrims in that area. I went there myself, it was enormously interesting. There are many different cultures meeting there, but of course the main culture is Muslim. MW Perhaps you were too young to remember, but did international musicians come to Baku during your childhood? SLAVA Yes, for example my mother and my father, they were completely Russian, although my father had some different blood too. MW But do you remember hearing concerts ( when you were small ) by musicians from other countries apart from Russia? SLAVA No, I didn’t have a subscription to concerts during my first four years! MW Somewhere you said that you believe that your father was a better cellist than you. MW In what way could he have been better? SLAVA Yes, yes. You know I swear to God that my father was phenomenal and yet he wasn’t a celebrity. He had such a modest character that he said “ If people want me, they will ask me ”. But he himself asked for nothing and did not promote himself. Many many great artists knew that my father was a fantastic cellist. Although his fiftieth birthday was not celebrated because of the war, many great musicians including David Oistrakh, the very great violinist Miron Poliakin, the pianists Goldeweiser, Neuhaus - and composers - all the best musicians in Russia wrote a letter saying that the 50th birthday of this phenomenal artist should be celebrated. Amongst musicians he was very famous and recognised, but of course during the last two years of his life he was evacuated to Orienburg ( during the war) with the whole family. He was better ( than me) in all respects. But you know of course that my father died when I was fourteen years old: maybe if I heard my father today, as I know more than I did then, I might think differently. But until I was fourteen years old he was like an idol for me. And I am very happy that he is still my idol. MW Was the Soviet “System” of musical education with the special music schools already established during your childhood? SLAVA I must say that the best thing in Soviet Russia was education, particularly education for music. If chidren had any musical talent they could attend music school without payment. The musical education was very long in Soviet Russia - basically it was normal in each big city to have several music schools quite separate from the normal comprehensive schools, and children stayed for seven years in these schools. Then they progress to the middle school for five years, and after that to the Conservatoires ( which were in all big cities ) for another five years. And in the Moscow Conservatoire you could also continue for another three years post-graduate study: that’s altogether twenty years! And that’s a good system. MW And that system already existed when you were a child? SLAVA Yes, yes. I think it was improved later on, but it existed when I was entering musical school at the age of seven. MW As far as cello playing goes you were part of an amazing dynasty, starting with Carl Davidov who was Professor in St Petersburg from 1863, followed by his pupil Wierzbilowitz, then your father Leopold and your uncle Semyon Kozolupov. SLAVA Yes, yes, Wierzbilowitz was my grandfather for cello! MW Were you aweare of this tradition being handed down through these different generations? SLAVA Yes, yes of course. I certainly was aware of this. My father also appreciated and valued that a lot and was definitely an heir to this tradition. In my father’s time there were not so many of those people. There was still a cellist called Brandukov ( for whom the Rachmaninov Sonata and Pezzo Capriccioso were written) and the last great professor in this dynasty was Kozolupov. MW Do you feel that you are the end of the line of this dynasty - what has happened to it? SLAVA No,no. I think that I pass on what I have to all my pupils, and if I succeeded in giving you some good advice, it came from Carl Davidov! MW Slava, you have always had a unique sound. Absolutely unique. Was that something that was conscious in your training, to find your own sound? SLAVA Yes, you know, that’s true in terms of a general sound, but for me what was most important in my life was to understand that I needed one hundred or maybe two hundred different sounds for the cello, that’s the most important thing. When I look at a musical score, even if I haven’t seen the music before, just from reading the score without my instrument I try to understand what kind of emotion the composer had when he wrote this composition. Because for me the composition is like a script of the emotions and feelings experienced by the composer when he was writing the music. I’ve known many composers very well, and for example when Benjamin Britten played me his compositions on the piano for the first time ( and he was a fantastic pianist) or even when both Shostakovich or Prokofiev ( who played less well in their later years) played to me, I not only listened but I watched their faces. And when I saw that these faces expressed some intense ( suffering) feelings I recognised that these were very important places in the music, even if they didnt play so well. And sometimes the emotions would surface in a more obvious way. For example, when Shostakovich played the First Cello Concerto to me for the first time, I knew that in his private life he was having great difficulty with his wife, whom he was divorcing at that time. When he played the Second Movement for me, I saw at one moment that tears were rolling down his cheeks, and striking his chest he said to me “Slava, I’m sorry, but this composition is very near to my heart”. MW Just to go back to the question of sound again Slava. A lot of people talk about a “Russian” sound, when they talk about string playing. Do you think that description also applies to orchestras, and underlines a difference between Russian orchestras and Western orchestras? Can you get the sound you want from orchestras in these different countries, or do they sound very different? SLAVA Yes, you know that does happen as a result of national character, national personality - the Russian character is very emotional, that’s why they immediately attack music. But for example another character in another country may be quieter, a more intellectual approach to the sound. I cant say which is better, but it is different. Now it’s very interesting, maybe fifty years ago when I participated in my first national competition in Russia, or in 1947, 1949 or 1950 when I was three times in international competitions, it might have been possible to see differences between different cello schools. For example if a German cellist sat down to play, you could immediately tell that he came from the German school, the same with French, also different, or Russian, different again from both. Now, everybody has more or less the same school, and that’s because of the enormous progress in recording. We have much more information about our playing, many musicians coming from one country to another. Now many of my pupils are professors in different countries, for example Geringas in Germany, and Karine Georgian teaches there too. Some good German cellists teach in Russia,etc. That’s why there are not such great differences in the style of performance now. Now all the schools have adopted the best traits from each other. MW You grew up in very turbulent times Slava. Stalin had just come to power not long before you were born, Were you aware of politics in your youth, or was that something that didnt concern you? SLAVA No, no, I remember many things. They were very scary times. I remember friends of my parents very well - nice people - I remember some of their names. I know that sometimes my mother and my father were very sad. One day for example they took me ( aged about six ) and my sister for a walk in the street - the whole family. They stopped suddenly at the communal door to a block of flats, and we stood waiting while my father ran up the stairs. He went to the flat of a friend, and then returned to where we were waiting. He whispered to my mother “The door is sealed”, because when we had telephoned there was no answer. He had to go and see for himself that they had been arrested and the door blocked, but we were lingering downstairs to cover for our father, pretending that we were just out for a walk, in order not to make it obvious that he was checking on somebody. I remember people disappearing before my very eyes. People vanishing into thin air - many many people. MW Did you submerge yourself in music to try to forget these things? Was it possible? SLAVA Yes, to be honest these things didn’t take up the biggest part of my life. The fact that I could play music, and the fact that my parents were trying to make the most of things in the family to make us happy were the most important things in my life. MW In 1943, the year that the siege of Leningrad was broken, you enrolled, aged sixteen, at the Moscow Conservatoire. What sort of effect had the war years had on the Conservatoire? SLAVA Well this was possibly the most important time in my life, the two years following my father’s death. That was the beginning of my “University of Life”, my real education. That was when were evacuated to Orienburg during the war. We went there to live with my Godmother. She lived there all her life - she was a teacher in a school. She was an amazing person. Life was getting worse and worse from a practical point of view. There was no heating, no wood to make fires, and the frosts were incredibly severe ( English people would have no idea just how severe! ) - water froze inside the house. But I continued to go to school there from the age of fourteen to sixteen. And then I had to start to think about how to raise money for food. My Godmother’s brother was a doctor, and for some reason he had lots of test tubes stored in his shed! I also found a large grinding stone there and learned to grind off the bottom of the test tubes. Connecting this glass pipe through a hole to a glass jar, I was able to make a lantern. And my Godmother would go and sell these lanterns in the market. Soon I had a very good little business going! And when I went to Moscow to the Conservatoire, I sometimes joined a hobbies group at the Association of Architects, and I learned to make picture frames for exhibitions of their drawings. So I made frames. And then things got better and better financially! MW 1943 was the same year that Shostakovich also joined the Staff of the Moscow Conservatoire, so presumably there was a feeling of optimism that the war was nearing an end - at least the Leningrad part of the war was over. Was there a new kind of euphoria at that time, even though the war with Germany wasn’t actually finished? SLAVA Firstly it was necessary to have special permission to return to Moscow - it wasnt possible to simply go without permission. But as I had lost my father, and we had a room in Moscow, permission was sought for me to go to Moscow to enroll as a student at the Conservatoire. When I came to the Conservatoire I was the youngest student there. Normally people were accepted aged eighteen, but I was sixteen then. There was an atmosphere of hope in 1943, but there was for example a ten o’clock curfew, there was strict control, and definitely still a feeling that we were at war. Of course I will never forget the 9th of May 1945, the end of the war, that was really the start of a new life for me. MW 1945 was the same year that you won the All - State Competition wasnt it? SLAVA Exactly. It was the first All - State Competition for seven years as, it had been stopped for the war. Previously it had been every two years. So there were many young musicians who had been eagerly waiting for the competition to start again. MW In 1948, which was about the same time that you finished your studies at the Conservatoire, Shostakovich and Prokofiev were both rebuked by the famous Zhdanov Decree against “Formalism in Music”. What were your personal feelings about this? MW What did you feel when you saw that? SLAVA It was a turning point in my life. Because previously I used to believe that the Soviet system was not so bad. We were always being told that everything we had was thanks to the great Stalin, and in fact the education I had had was extremely good, but that was an enormous shock. And I understood very well that this persecution was without justification. But even worse for me was to see the people I had thought had integrity and artistic judgement willingly supporting the persecution. I remember very well one day in the Conservatoire when suddenly all the bells rang in the corridors and everybody was told to come to the main concert hall. When I arrived officials were already seated on the stage. Then Professors came out one by one and made speeches saying that their eyes had at last been opened to the fact that these people who called themselves composers were devoid of talent. Thank God I understood what was going on. Then a competition began to see who would voice more criticism in order to advance their own positions, even in order to get better living accomodation. That taught me that I had to know where I stood. I have to say that very quickly there was a vacuum round these people - Shostakovich and Prokofiev - and that’s why I was close to them at this time. Prokofiev especially was very lonely - more than Shostakovich. Prokofiev wanted to have someone loyal close to him and so he invited me to stay with him at his dacha from early spring to late autumn. Those are unforgettable years of my life. I saw him composing, we talked about everything under the sun, we listened to records of his music. That was especially interesting because he would put on records of different performances and told me what he liked or didn’t like. I remember all that very clearly. MW Looking back to Shostakovich again, we know that to some extent the voice of “protest” against the society in which he was living comes through his music. And that voice became the passion in his music. Do you feel that your experiences of living through those times deepened your sense of what you could say through music? SLAVA Nobody should be compared with Shostakovich. I’ll tell you why. I was able to carry on performing as usual and to play my usual repertoire - only Shostakovich and Prokofiev were not allowed for several years, but otherwise I was able to carry on working. Shostakovich was very scared that he would be arrested and not allowed to compose. I know that, because he once told me “ I have such a large family to provide breakfast for tomorrow, I worry that I wont have even enough money for a dozen eggs.” So he was incredibly scared, right to the end of his life, that he would be caught for saying something that was not allowed. He was afraid that he would be denied his “voice” through music - that was what he was really afraid of, so sometimes he would sign communist letters condemning dissidents. Once in private I asked him why he signed these letters, and he said to me “ I dont read these letters - I never even turn them around - I sign them upside down. People will learn more about me through my music than my signed letters.” Those were his very words. MW Everyone in the West talks of the “Russian” soul. But you grew up in the Soviet era which claimed as one of its goals the abolition of poverty and the injustices of a rigid class system. That could also be regarded as a spiritual aspiration, and one can understand the “religious” fervour of the early Bolsheviks. Do you think that anything good came of that system, or was there a fundamental flaw? SLAVA In my opinion the system gave nothing to the people - it was based on a false theory, from the start. It’s not possible to make people equal if God didnt make people equal. The most egregious mistake of the Bolsheviks was that when they decided to give equality to everybody, those without knowledge or talent were often put in positions of power over far more educated people. Equality versus morality is a very complex issue - even now in Russia we grapple with the misuse of “equality”, rich people can very easily exploit others, stealing, and yet at the same time there are also poor people who, by sticking to their principles, will continue to be poor. MW When I came to Moscow in 1969, I recall the atmosphere in the Conservatoire as being incredibly exciting - it had been a decade of wonderful teachers - apart from yourself, there had been Neuhaus, (Richter’s teacher), and the violinists Yankalevich, and Oistrakh, and many more distinguished professors, some teaching in a more traditional way, others less. Your classes, while they were extremely demanding, were also incredibly spontaneous, and there was lots of laughter, lots of jokes. Did your style of teaching change over the years since you started? SLAVA I dont think so. The personality of the teacher came through in his teaching. The same thing with Neuhaus - he was always the same , with a fantastic knowledge, fantastic joy. And I’m convinced that this free style of teaching gives the student freedom - he’s not afraid to make mistakes A strict severe professor doesn’t encourage internal freedom! For me Neuhas was the ideal as a teacher. MW It seemed to me ( coming from the West in the libertarian sixties ) that In Russia there was quite an interesting mixture of traditional values and more forward-looking ways of teaching. The students had great respect for their teachers but there was also very good communication with their professors. SLAVA Yes. absolutely right. It was also the key to success. For example I knew each student in my class individually - what their interests and aspirations were. MW ...........I remember so many amazing occasions in the class. You had an amazing group of students which had included at different times Natalia Gutman, Jacqueline du Pre, Karine Georgian, Mischa Maisky, and David Geringas, and many more. But when things began to change with your departure in 1974, I think a lot of people felt that it was the end of an era. Do you think it had been a Golden period for the Conservatoire? SLAVA Well, its very difficult for me to say. When I left Russia it was the worst time of my life. I didn’t believe there was any future for me. It was a miracle for me that life did go on. MW It was interesting that so many great Russian instrumentalists also taught. That somebody like you, who had a very busy life, still took time to teach. SLAVA Ah, I’ll give you a clue as to why that was! In our country we had very little faith in anything. We were under the thumb of those who might allow us to go abroad to give concerts one day, and refuse us the next. They would just as easily cancel concerts inside the country. My concerts were also cancelled in the Soviet Union in my last year. Therefore we all reckoned that teaching was a kind of stability, it was the only thing that we felt was secure. So everybody was keen to teach! MW But did you enjoy teaching, Slava? SLAVA Yes, I enjoyed it very much, and not only did I enjoy it, I learned a lot myself from teaching. You probably dont know how grateful I am to you, for what you taught me! Honestly! Thank you very much. You helped me enormously ! Yes. yes, that’s for sure. I really learned a lot. MW I can understand, of course, from my own limited experience what you are saying. I remember more recently when I showed you some photographs of the class, you passed rather quickly over the ones of Stefan Kalianov [ Assistent to Rostropovich and a Party Apparatchik within the Conservatoire ]. Was he a problem to you? SLAVA Yes, he was a a very difficult person, I had doubts about his personality. I could never call him a great musician. He always made notes, carefully writing down everything I said. If I said to a student “You need more temperament here”, he would dutifully write on the music “More temperament needed here ”. But then, let’s say another student came along who was already playing with lots of temperament, nevertheless Stefan would look at his notes and say “More temperament, more temperament!”, so I would have to say “ Less, less, quieter, quieter!” So it went on ! MW He wrore a book on technique, didnt he? SLAVA No, no. I trusted you. MW I was very naive about the dangers, but at the same time I felt very privileged that you had asked me to do this. SLAVA I trusted you a hundred percent. MW I imagine you must have had some vary “interesting” confrontations with Ekaterina Furtseva, the Minister of culture for fourteen years, who died shortly after you left? [ She was notorious for “punishing” Soviet performers unless they toed the line.] The then British Minister of culture, Lord Eccles, wrote in his obituary of her that she was “outrageous and fascinating, beautiful and brutal. One meets so few ministers with such energy, magnetism and command over their departments that I very much regret I shall not quarrel with her again”. Would you share his sentiments? SLAVA You know, in fact I can say that, in spite of everything, I admired Furtseva. I will never forget how once, at a very difficult time for me [at the time Rostropovich was sheltering Solzhenitsyn in his dacha outside Moscow, while he was researching and writing August 1914 ], I was summoned to the Ministry of Culture to see her. She looked at me and the tears rolled down her face. She said to me “What are you doing? Do you understand what you are doing?’ and she cried openly. When I go to Novodevich Cemetary in Moscow to visit my friends [ Shostakovich is buried there], I always stop at her grave. MW Are you optimistic about the future of cultural life in Russia, Slava? SLAVA Yes, yes I am optimistic. I dont know why it is, but unexpected talent appears in unexpected places. Somewhere in the taiga or the tundra - you understand. But it seems to me that this particular period is a very difficult time for Russia. The blessing of this time though is that there is no civil war going on. I was so sure that civil war would erupt: it is a miracle that the communists just gave up - it is illogical, I dont understand why. I think it’s a miracle - a gift of God. MW I’m interested that you say that, because when I heard what had happened I could not believe it. When I was there it seemed such an impossibility that such a system could change. But what about the cultural life in the Conservatoire? SLAVA It is a very difficult period now. And that will go on for a while. Now people are occupying key positions without real qualifications, neither talent nor human qualities. No, that’s another way of exploiting people against each other. Integrity and honesty are not seen at the top. Everyone is working for himself. MW I would love to hear something about your relationships with Oistrakh and Richter, two very different musical personalities from your own. Apart from your individual partnership with Richter, and the Beethoven Triple Concerto with the three of you, did you ever play chamber music together? MW But did you think of playing Trios with Oistrakh and Richter? SLAVA No no. We only played the Triple Concerto. Because we each had different trios before. David treated me wonderfully - I have an amazing letter from him with a signed photograph. 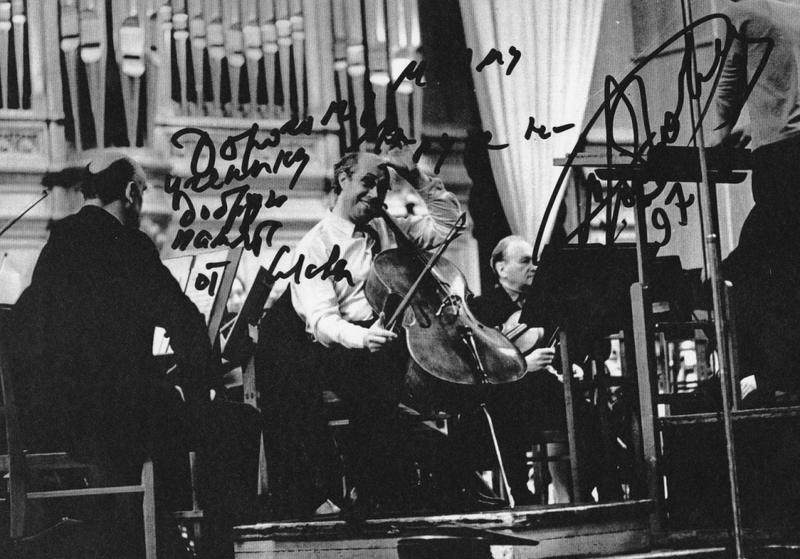 He was a person of great integrity, and he had a trio, before I was an established cellist, with Oborin and Knushevitsky. But I wanted to play trios too, so formed a trio with Gilels and Kogan. And there was a lot of intrigue between us ! People actually spread rumours that I was leaving my trio to join Ostrakh, and it was a major topic of conversation. But all the same we stayed loyal to our different trios. And I only gave up playing trios eventually because of a personal quarrel with Kogan, but I remained very grateful to Gilels with whom I played with great pleasure. So Richter found himself between the two of us [Oistrakh and Rostropovich], nor did I find it so comfortable playing Sonatas with Richter and Trios with Gilels! My partnership with Richter was established very easily from the beginning, because in 1949 when Prokofiev wrote his Cello Sonata he requested that I should play it with Richter. That was his wish. So we put a whole recital programme together. Then later we played all the Beethoven Sonatas, Grieg, Chopin, all three Bach Sonatas, a lot of repertoire, and that was a very great joy for me in my life. But it happened that after the episode with Solzhenitsyn, Richter and I stopped playing together. I didnt want to beg him to play with me, and and he didnt ring me, so I didn’t bother him. It seemed to me, in fact I am convinced, that he was afraid to contact me. MW I owe an enormous debt to Benjamin Britten who introduced me to you and without whose help I would never have got to Moscow. You were very close to Ben and yet totally different personalities - what was at the heart of your friendship? SLAVA Ar the end of my life I can name three heroes, three supreme figures: Prokofiev, Shostakovich and Britten. My relationship with Britten was different from the others because when I came to know him I was more mature as a person and musician. With Prokofiev and Shostakovich I was more like a student, but with Ben, though not his equal - I was his student - I was more developed, older. For me he opened my eyes to completely new human qualities. I had never met anyone like him before. And of course I was overwhelmed by the wealth of his music- the ocean of his music. I dont know anyone who played the piano better than him. I stopped playing the Arpeggione Sonata after he died - it was impossible to find anyone else who would rise to his level. He was also a fantastic conductor. It was such a joy for me to play the Tchaikovsky Variations or the Schumann Concerto, and if he played his own compositions, he was really a genius. There were only two composers [Britten and Shostakovich] who composed so perfectly for the instrument that you didn’t have to change a note, and that was the case with Britten, even with the many new effects he wrote. But they were so logical. But for Prokofief, no! Sometimes he composed things that were really impossible for the instrument, such as impossibe double stoppings and so on. And I would have to help him “Change them, Slava, change, change!” he would say. On top of all the other musical qualities that Ben had, he was an incredible personality. He was a very strong personality. On one occasion I remember a conflict with a conductor - banging his fist on the table he said “ I ask you never to touch my music again.” I could never have imagined that he would have been able to say such a thing. And he was right -it was one hundred percent logical. And he was such a magnet for me that if I hadn’t seen him for a long time I felt myself drawn to him as though attached by strings, even from a hundred thousand kilometres. Everything that he did, his way of life, his mannerisms, even the way he prepared tea, was like a gift to me from God. MW I dont know if you remember, when he was very ill, near the end of his life, you once gave me some medicine for him to bring back to England. It was a strange looking green medicine, like a block of green resin - I dont know where it came from - you must have got it from a doctor....? SLAVA No, no, from Solzhenitsyn. It was mumio - supposed to be a miracle herb [ a very rare herb collected in the mountains in the Caucasas)] Yes, yes, he had great faith in this. It was very difficult to get hold of. MW Because it was very important to get this back as soon as possible to Britten, and my plane was two hours late, when I got back to London I rushed to go through customs as quickly as possible. But I nearly got arrested, as the Customs Officers found the medicine on me and hauled me off to a laboratory to do various tests on it. I sat there in a cold sweat not knowing what was in this stuff, but fortunately they couldn’t identify it! Once I was released it did get to Aldeburgh because Rosamund Strode, who used to help Ben, had come to get it. But I dont know after all that if Ben ever took it. MW In the midst of all your incredible activities, Slava, is there anything that you have not achieved - anything else that you would still like to achieve? half-way through ! It gets more and more difficult to climb, but nevertheless I have to move forward! MW Well Slava, the time that I had in Moscow with you was the most incredible time of my life, and I can never thank you enough. And all I can say is Happy Birthday !